Pune has won… Dada has won. But wait! Last time also Pune won the first two game sand then everything went down form there. But that was last year and a memory. In these two games the team is wining, and has been led from the front by S.G aka Dada. In the last game i felt that the combinationwas not right and some tweak is needed. I had expected Tamim and Ryder to open…. ok Ryder and Dada looks ok for now. Ryder can be dangerous when he gets his confidence and DADA gave him overs to ball to get his game going. For Dada one knock of 40+ in quick time will get his guns firing again for the tournament. This will happen. The turning point of the game was the 19th over in PWI innigs which wnet for 25 runs…. something crazy that over. If Pakistani was bowling that over, some section would say spot fixing…. who knows? The road is still long ahead…. 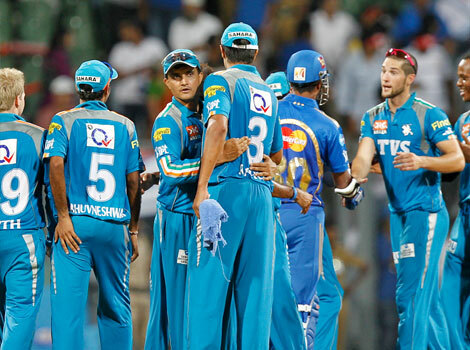 but it may the IPL of the undergods – Dada and The Wall, both out to prove a point. RR is also making its own sweet story by defeating and crushing KKR comphrensively. KKR still not getting in the Bangla lion, at their own peril. Well… hope they learn that and introduce him. It will give them some spine which their captain seems missing. If there are 2 more defeats… there will be infighting in their camps reminescent of IPL2, and the multiple captain theory. Har team mein ek gunda chaiye… correct, but team mein Captain bhi chaiye. and my fellow scorpion was …. Pstttt…. was caught smoking in a public place check this like: http://twitter.com/#!/kvpops/status/188985127668432897/photo/1 and the photo is her. See how Mr Happy is may be trying to caution him that he is on TV. Public smoking is banned in India. May be for KKR management Stadium is personal home. 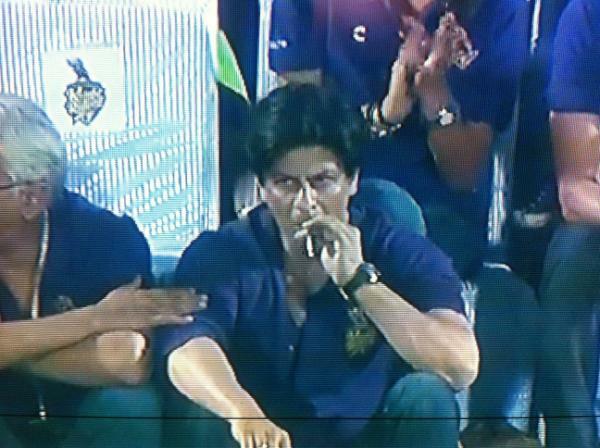 Well if it was Eden garden then may be… but will someone take action. No need… SRK is god! Till then…. SRK can only say… chalo paint karo! And another observation, the CKS non owner our Mr Satyanas… was in TV for a moment, just a moment and the camera zoomed off like he had given instruction not to focus. I don’t know… I just speculate. To Sum it up from a twitter account: No one can replace Dada even if he scores Zero in all 16 matches. Once a Gangulian always a Gangulian. PWI Weakness: Complacency… got to tighten it…. Come on Warriors. Jai Maharashtra. Disclaimer: All characters in this blog and article are fictionnous, and no harm is intended. Also I don’t exist and I am terminal.